I had colored and paper pieced this image yesterday in my efforts to make a card for the Sweet Stampin Christmas in July Challenge that can be found here: http://sweetstampinchallengeblog.blogspot.com/2012/07/christmas-in-july.html. 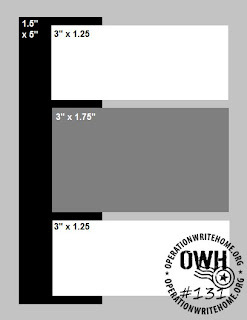 The OWH Sketch seemed to be the perfect layering layout I need to finish the card. The image I had found last year via Free Digital Stamps which may be located here: http://markerguru.blogspot.com/. I thought she was a cutie for sure! Really cute picture and nice coloring. Thanks for sharing. Cute card, love the sparkle! Cute! I'm wondering how you colored her hat with the white? It looks just like snow. Great job. Erika...I used Liquid Pearl...Thanks for asking! Absolutely ADORABLE!! Love love love the image and think it's definitely going to make some one very happy! I love paper-piecing and how cool it looks on cards. You've now inspired me to great a paper-pieced project very soon!! That sweetie is so cute!! Nice holiday card. What a sweet card. Very cute! Hi Linda, oh how sweet! Love the sparkly hat! !